Gender-specific restrooms can be unwelcoming and potentially unsafe for many people whose gender identity falls outside of traditional gender norms. Shifting from gender-specific single-stall restrooms to gender-neutral ones is a simple and low-cost way to help ensure that facilities are welcoming and open to all people, regardless of the way one presents or identifies their gender identity. 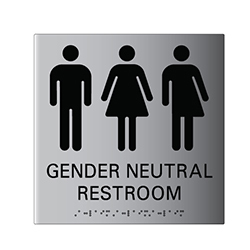 Click this link for a quick overview of ADA Signs Required for Restrooms. ADA/Braille Sign Mounting Location and Height-Where permanent identification signs are provided for rooms and spaces, signs shall be installed on the wall adjacent to the latch side of the door. Where there is no wall space on the latch side, including at double leaf doors, signs shall be placed on the nearest adjacent wall, preferably on the Right. Mounting height- Wall signs shall be mounted 48 inches minimum above the finish floor or ground surface, measured from the baseline of the lowest Braille cells* and 60 inches maximum above the finish floor or ground surface, measured from the baseline of the highest line of tactile letters Mounting location shall be determined so that a person may approach within 3 inches of signage without encountering protruding objects or standing within the Swing of a door. *California regulation. Federal regulation 48" minimum to baseline of the lowest tactile characters.